A Judæo-Dutch journalist, translator, and writer of school-books; born at The Hague Sept. 24, 1761; died there June 29, 1827. 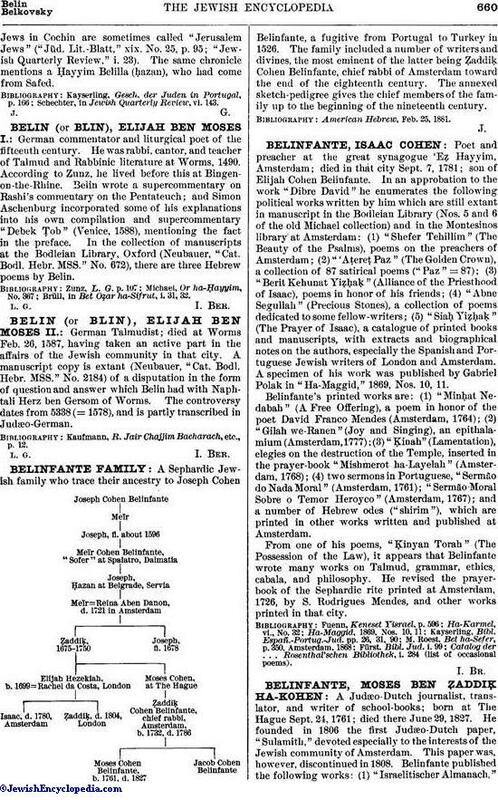 He founded in 1806 the first Judæo-Dutch paper, "Sulamith," devoted especially to the interests of the Jewish community of Amsterdam. This paper was, however, discontinued in 1808. 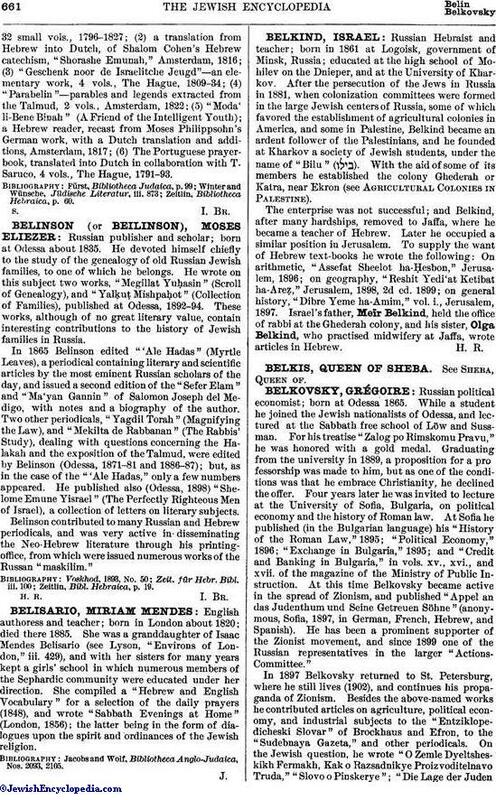 Belinfante published the following works: (1) "Israelitischer Almanach,"32 small vols., 1796-1827; (2) a translation from Hebrew into Dutch, of Shalom Cohen's Hebrew catechism, "Shorashe Emunah," Amsterdam, 1816; (3) "Geschenk noor de Israelitche Jeugd"—an elementary work, 4 vols., The Hague, 1809-34; (4) "Parabelin"—parables and legends extracted from the Talmud, 2 vols., Amsterdam, 1822; (5) "Moda' li-Bene Binah" (A Friend of the Intelligent Youth); a Hebrew reader, recast from Moses Philippsohn's German work, with a Dutch translation and additions, Amsterdam, 1817; (6) The Portuguese prayer-book, translated into Dutch in collaboration with T. Saruco, 4 vols., The Hague, 1791-93. Zeitlin, Bibliotheca Hebraica, p. 60.